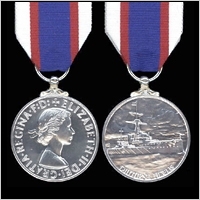 ROYAL FLEET RESERVE LONG SERVICE MEDAL. Awarded for 15 years service in the Royal Fleet Reserve. Available with either: Geo.V. , Geo.VI. or EiiR. Obverse. In MINT Condition and complete with a length of ribbon. PAYMENT IS REQUIRED BEFORE ANY ITEMS ARE DESPATCHED. PLEASE NOTE THAT WE DO NOT HAVE FACILITIES FOR "ON-LINE" ORDERING OR PAYMENT BY ANY TYPE OF "CARDS". BY PERSONAL CHEQUE, BUILDING SOCIETY CHEQUE OR POSTAL ORDER. WE CAN ALSO ACCEPT PAYMENT BY DIRECT BANK TRANSFER AND DETAILS CAN BE SUPPLIED UPON REQUEST. CUSTOMERS IN THE USA WHO EXPERIENCE DIFFICULTY IN OBTAINING STERLING DRAFTS MAY PAY BY PERSONAL CHECK IN US DOLLARS SUBJECT TO THE ADDITION OF MY BANKS' FOREIGN CHECK CONVERSION CHARGE ( FROM £6.50 to £8.50 ) - PLEASE ENQUIRE FOR CURRENT EXCHANGE RATE. WE CAN ALSO ACCEPT PAYMENT BY DIRECT TRANSFER TO OUR BANK ACCOUNT SUBJECT TO THE ADDITION OF ANY TRANSFER CHARGES INCURRED - PLEASE ENQUIRE FOR DETAILS.